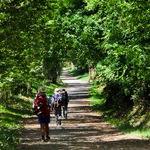 The EuroVelo 6 is a long distance cycle track from the Black Sea to the Atlantic. It runs a total of 2,270 miles along the course of some of Europe’s major rivers. Rupert Parker tries a short stretch in Burgundy. Before I leave home, I agonise about how much to pack, since I’m going to be carrying everything on my bike. Riding with a rucksack is not a good idea so I only take what I can fit in two small panniers. To get to my starting point in Dole, I take the Eurostar, cross Paris, and then catch a fast train. It’s a pleasant way to travel and, since there’s no direct flight, is also probably the fastest. I’m staying at the B&B Maison Curie in the centre of town and another famous scientist was born in the city. Louis Pasteur lived in a tannery on the banks of the canal until he was four years old and they’ve preserved his house as a museum. It’s worth lingering in Dole for a few hours as it was the capital of Franche-Comté for over 300 years and imposing buildings include the magnificent L’Hôtel Dieu, once the hospital, reflect its prosperous past. 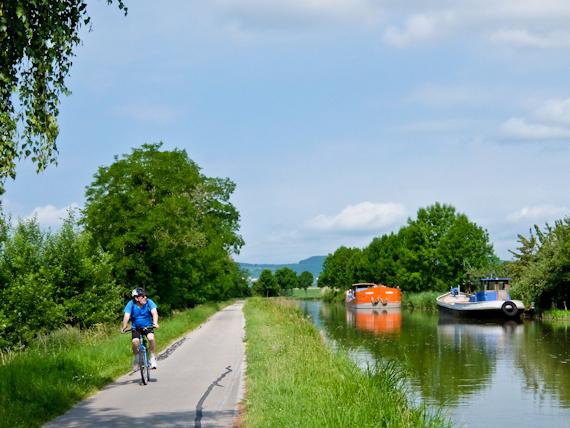 The Rhine-Rhone canal runs through the centre and I cycle along the tree-lined towpath before meeting the Saone River. This is a quiet stretch of waterway, its surface floating with water lilies, deserted except for the occasional pleasure boat. After 10 miles I reach the port of St Jean de Losne, a major centre for boat hire, at the intersection of two canals and the Saone. The water is wide here and its banks are stacked with craft of all shapes and sizes. 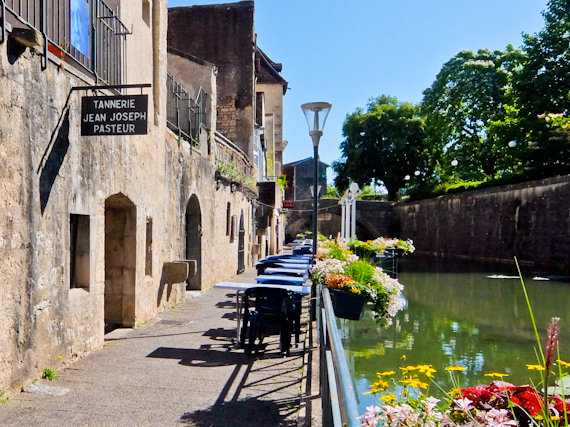 Skirting round the village of Pagnes, I leave the river for a while, but rejoin the Saone at Seurre where I overnight in B&B La Valériane, once the gendarmerie. The family invite me to their Saturday barbecue and serve some choice cuts of Charolais beef, sourced from the local butcher. The generous owner, who’s also the town’s major, opens bottles of quality vintage Burgundy red wine and my French seems to improve immeasurably. Next morning, the breeze helps clear my head and I cycle cross country to join the River Doubs. 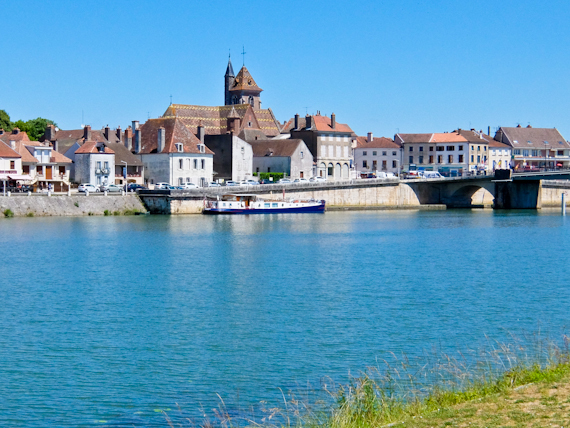 This meets the Saone at Verdun-sur-le-Doubs, famous for Pôchouse, the Burgundy equivalent of Bouillabaisse. It’s a stew of local river fish, cooked in white wine and I get to sample it at Hostellerie Bourgignonne. 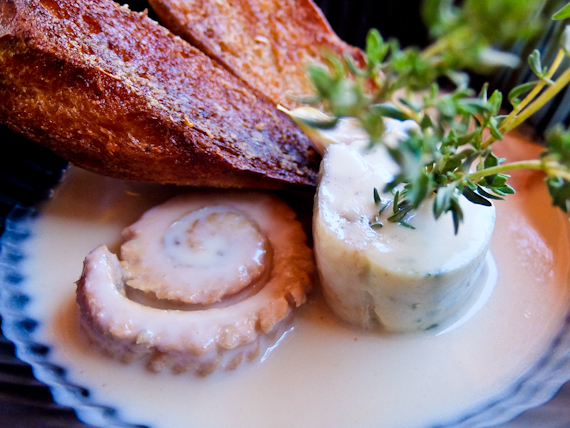 Their version removes most of the bones, adds cream and includes eel, pike perch, perch, tench and carp. There are also a couple of slices of toasted garlic bread to soak up the juices and it’s the perfect lunch for a hungry cyclist. Perhaps because of the influence of the wine, I slightly lose my way and end up taking the main road, stalked by thunderous trucks. It’s also the hottest day on my route and I arrive in Chalon sur Saone, completely drained. After downing copious amounts of water I explore the city. 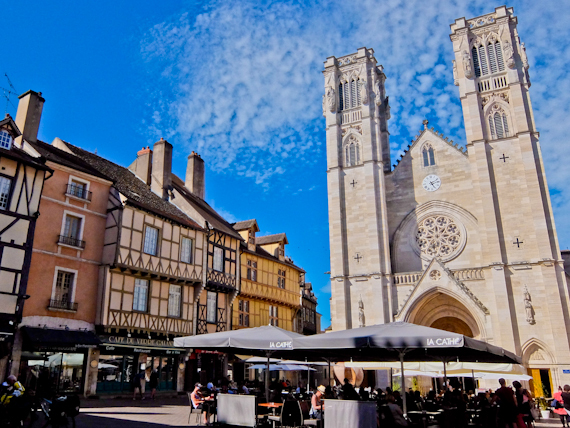 Its medieval quarter is mostly intact and the two towers of the impressive St Vincent cathedral dominate the square. 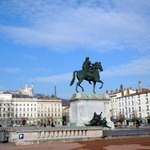 Chalon’s most famous son is Nicéphore Niépce, credited with the invention of photography, and he has his own statue by the river. The Hotel Ledracy is 3 miles away, slightly off track, but it not only has a refreshing swimming pool but also serves excellent food. Next day I follow the Canal du Centre, which connects the Saone to the Loire in a series of 80 locks. I encounter more cyclists and canal is busy with pleasure boats. I’m nearing the famous Burgundy vineyards and stop in Santenay at Domain Prosper Maufoux for a tasting in their cellar. It’s cool here but the winemaker tells me that Pinot Noir, their archetypal red grape, will struggle with global warming. If temperatures keep increasing, they may have to replace it with another grape variety. 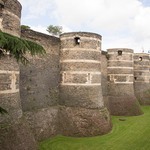 At St Leger sur Dheune, I leave the EuroVelo 6 to visit the magnificent Chateau de Couches. As you’d expect, it’s built on high ground and after spending my days cycling on the flat, the climb is a bit of a struggle. In the grounds lies the B&B Le Château de Couches Marguerite de BourgogneI and I spend the night feeling like the king of the castle. Next day I’m back on the Canal du Centre and enter the industrial heartland of Burgundy. All that remains of a ceramics factory that employed 500 people is the owner’s mansion, Villa Perrusson, recently restored. In Blanzy, near Montceau le Mines, there’s an excellent museum devoted to mining, an industry which once employed more than 13,000 at its peak. The mines are long gone, but here they’ve kept the original winding mechanism and it’s still in working order. Health and safety dictates you’re not allowed to descend so instead they’ve reconstructed a series of galleries just below the surface. Even though you’re not exactly underground, it works well in conveying the terrible conditions the miners endured. Sadly, this is the end of my cycling and I have my last lunch at Au Vieux Saule in Torcy, before catching the TGV to Paris from Montchanin. I’ve averaged around 40 miles a day and this small sample of the EuroVelo 6 has given me an appetite for tackling the whole route. It follows rivers and canals so it’s mostly on the flat and I don’t think it’s beyond my capabilities. The only problem is my tender bottom – I’m feeling slightly saddle sore so next time I’ll make sure to pack padded cycle shorts. 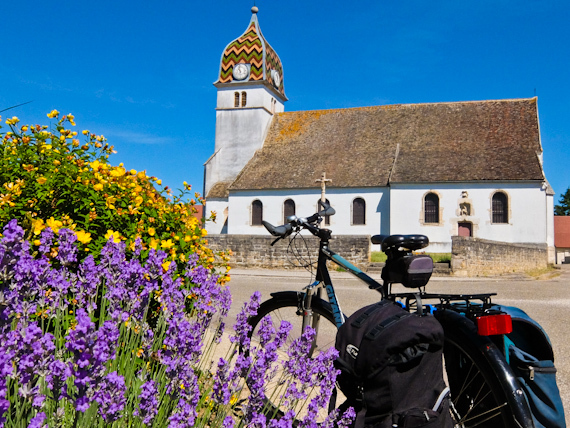 The EuroVelo 6 runs from the Black Sea to the Atlantic and traverses Burgundy and Franche-Comté. It’s well signed and almost impossible to get lost. 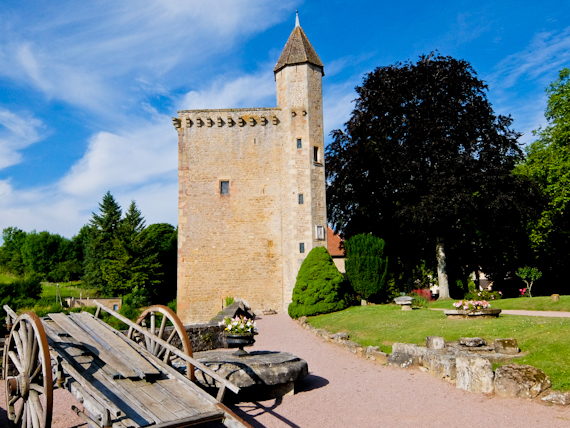 Bourgogne-Franche-Comté Tourisme has information about the region including places where you can hire bikes.